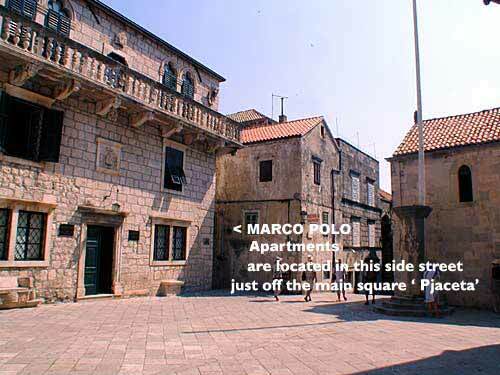 Marco POLO Apartments are located in Croatia, on the island of Korcula - one of the Dalmatian islands, in the Adriatic sea. 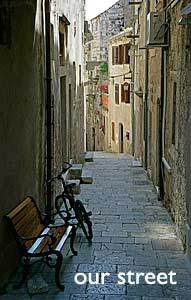 The apartments are situated in the charming Korcula terraced town house, located in the very heart of Korcula Old Town - a typical medieval and Renaissance Mediterranean town. Location of the apartments are in the street Ulica Marka Andrijica, which is a first street on the right just off the main Korcula Old Town square ' Pijaceta' The street is located right across the road of Korcula Town Museum, opposite the Korcula's Bishop's Treasury and around the corner of Korcula main cathedral Sv. Marko. Apartments are also conveniently located for easy visit to small restaurants and cafes located just few steps from Marco Polo Apartments on the edge of Korcula Old Town - area called Zakrjan. Our local restaurant (in our street) is Konoba Marinero- run by young couple whose home is in our street too. See more of Korcula restaurants..
Apartments Marco Polo are easily accessible from Korcula main bus station and / or Korcula's ferry terminal ( all on 2 - 4 min walk) so Apartments are ideal accommodation for people who want to be in the centre of the action, and don't want any hassle of driving, commuting or similar while on holiday. Note: If you intend to come in Korcula by your own car (or rented car) you can find parking place on the western as well as eastern edge of Korcula Old Town. Though, we must say, parking places in the very centre of Korcula are scarce and tend to be overcrowded in the summer months.